Anticipation was rising for this year’s ZONAMACO art fair in Mexico City that showcased the young emerging artistic talent in Mexico. In the aftermath of the devastating earthquake, which affected the city a few months prior, an abundance of gallerists, collectors and artists from all over the world flocked to Mexico City in defiance. Mexico city is fast becoming one of the most prominent artistic capitals in Latin America. The fair has gained a prestigious reputation on its 15th Anniversary whilst establishing a notable platform for selling, displaying, and promoting international contemporary art. 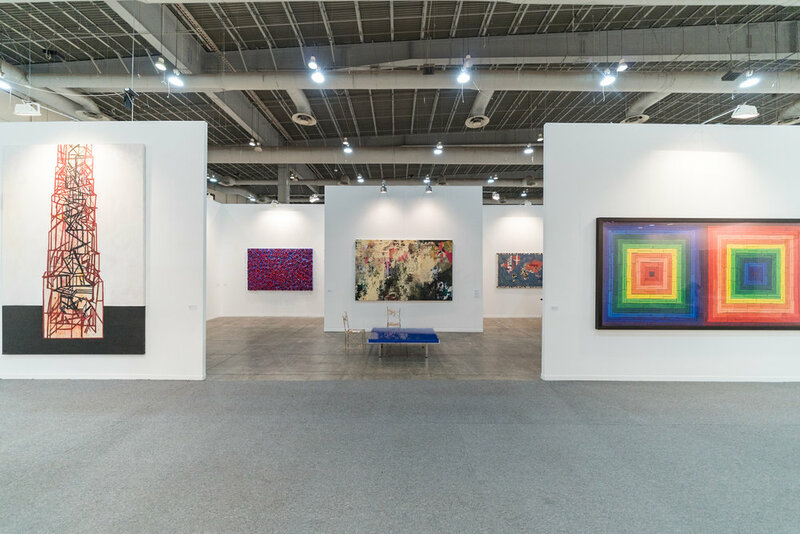 Assembling 170 galleries from over 25 countries there was a clear increase in international visitors from this year to the last, with collectors and dealers arriving from all corners of the globe. Planned within the European and American winter months it provides the perfect escape for anyone looking to experience exotic foods and wonder around colourful museums and galleries. In light of the excitement surrounding ZONAMACO, Mexican artists and galleries have gained great acclaim from international curators and collectors. With a wealth of new galleries and museums emerging, the more rooted galleries from the city make use of the fair as an opportunity to demonstrate the flourishing talent. Across the board, Mexican galleries seemed to be outselling their international peers. Yet, one cant help but wonder whether the support of emerging talent was more appealing to collectors than the other big names at the art fair. Cristobal remarked, “It’s sort of an endurance race”. Therefore was it necessary to make an effort to promote Mexican artists, which galleries such as Kurimanzutto and Proyectos Monclova have been doing for years. For it is only now the work is starting to pay off. The general section where the who’s who of the art world circulated provided some impressive displays from household names, but it was the smaller sections that drew a lot of crowds. Javi Estevez, owner of Galeria Mascota, was amongst the distinguished names of the young galleries at the fair whom alternative tactics. Estevez lessened the focus off the Mexican art scene and engaged with a more curatorial approach in his booth. He stated, “for me it was about planning the booth around an idea so that it’d be as curated as possible which means it wouldn’t be much different from a show at the gallery. I just wanted to show a little bit of the gallery’s attitude and style.” Galeria Mascota was one of many trying to make a name for itself, in a fair surrounded by the top galleries from around the world. ZONAMACO has quickly risen to become a distinguished fair. However something Javi and other galleries have speculated - is the fair becoming too decadent for younger galleries to survive? It certainly has allowed for other smaller more affordable fairs to appear, such as Material Art Fair, that happens during the same week as ZONAMACO. This validates the noticeable expansion that the local Mexican market is experiencing whilst also demonstrating the continued support from all side of the spectrum; Mexican collectors starting to take risks on younger artists but also supporting big names such as Damian Hirst and Jannis Kounellis. From a different perspective, LAMB Arts from Mayfair, London was not only commended on its curatorial skills, but for the high quality of art it brought to the fair, starring a young American artists called Matea Perrota. The young LA based artist who brought collectors from the US to Mexico to purchase her latest works, almost selling out of her work completely on the first day of the fair. Lucinda Bellm, since founding the gallery, has opened a cultural channel between London and Latin America on the pretence of, “the lack of recognition in the UK for a whole continent of artistic energy.” Now with the fair firmly on the map there is definitely no chance that collectors will be missing a stop over in Mexico to catch the artistic and curatorial skills of the moment.